Chicken Eggs — 4 pcs. 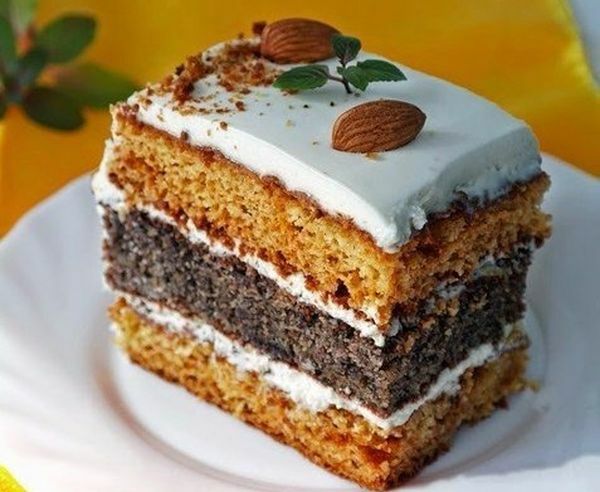 Munk — Article 5. l.
1. bake poppy seed cake (baking size 20×30 cm). To this end the dry poppy seeds in a coffee grinder to grind. Add semolina and baking powder. 2. Apple to clean, remove core and grate on medium grater. 3. Beat eggs and sugar with a mixer for 8-10 minutes until a fluffy foam. 4. poppies mixed with egg mixture, add the apple, softened butter and stir until smooth. 6. proceed to honey shortcakes. (Baking 40h30sm size). Beat eggs and sugar with a mixer until fluffy foam 8-10 minutes. 7. Honey is slightly heated in the microwave to become warm. Add soda and stir it. Mass will be white and airy. 8. Connect the egg mass and honey, add to it the sifted flour. 9. Carefully and thoroughly mix silicone spatula. 10. Pour the dough on a baking sheet and bake 20-25 minutes at 180 *. Cool without removing from the mold. 11. Cream. Sour cream is necessary to take the most fat. I had a homemade sour cream. Beat the sugar and vanilla sugar to a thick consistency. I would add sugar to taste, not weighed. 12. Honey cake cut into two parts. Cakes smeared with cream, alternating them so that the poppy seed cake was between honey. 13. Coat the sides and top plyatska cream and leave for impregnation overnight. 14. Cut plyatsok into portions pieces and you can put tea..